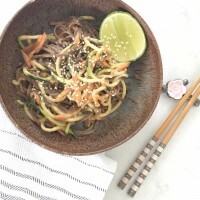 This 5 minute almond butter satay vegetable noodle bowl recipe came about when I was staring into the cupboard with a rumbling tummy and two starving children. It is amazing how creative you can be with what you have when the thought of going to the supermarket with two toddlers is the alternative. I’m allergic to peanuts so had never eaten satay. But I can have almond butter so I decided to see what all the fuss was about. 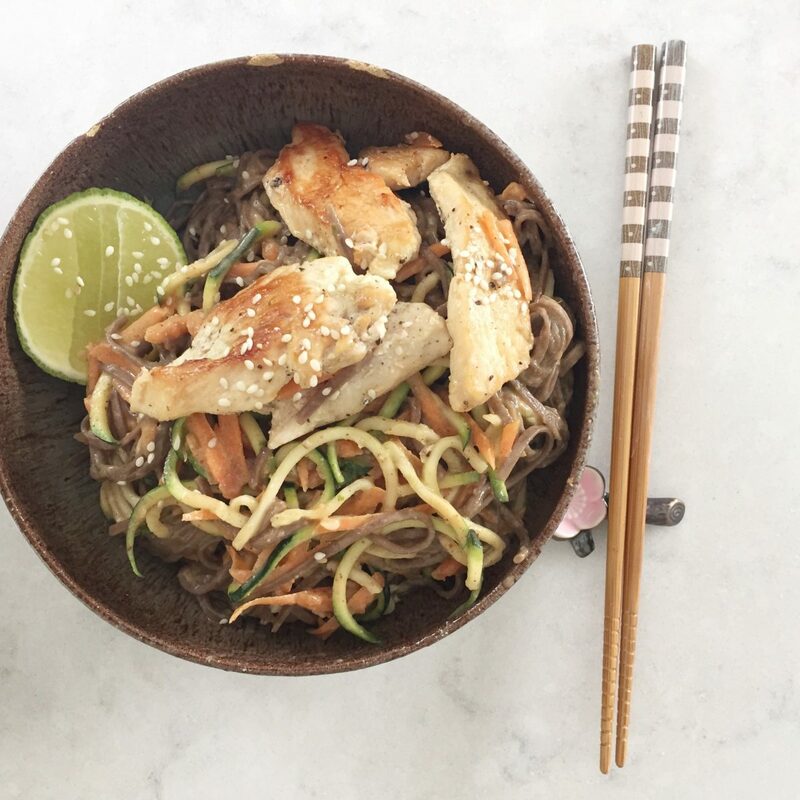 Now we have this protein and veg packed noodle bowl about once a week for lunch or dinner. It is so fast to make but is packed with flavour. It is so simple to make – my 6 year old is now in charge of making the sauce for this and my 4 year old grates the vegetables. Very soon I’m hoping they’ll make the whole thing while I kick back with a cocktail and a magazine. You can make this with any noodles – noodles cook faster than pasta so buy the ones that cook in the time you’re likely to have. Not those instant ramen ones though. I’ve made this with rice noodles and they are the fastest but the texture can be a bit gloopy. 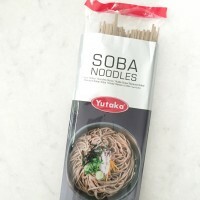 I usually use buckwheat soba noodles. They cook fast, have a great texture and are handily gluten free so no one feels left out. My children love them and have never noticed that they aren’t regular spaghetti. I’ve even made it with pasta shapes when I’ve been out of noodles. If you’re trying to get more vegetables into a meal, and who isn’t, then either grate or use a spiralizer to add courgette (zucchini) and carrot. The sauce ingredients are designed to balance each other out. So as you make it, taste it and adjust the different elements so that you end up with none of the flavours taking over. If all the flavour sensing areas of your mouth are stimulated, your food will taste delicious and balanced. If one area isn’t stimulated your food can taste overly sweet, salty, fatty or just bland. To help you understand how to adjust things, I’ve broken the sauce ingredients down by the flavours they give (sweet, salty, sour, bitter and umami). You can read more about flavour balancing here. I always make extra sauce so I can keep it in the fridge for the following week. This sauce is a great one to make with children and will keep in the fridge for a week or two, ready for quick meals. It can also be used to pour oven cooked chicken or fish, just be sure to heat it up and add some boiling water to loosen it. Active prep time: 5-10 minutes. Cooking time: 5-10 minutes depending on the noodles you buy. Optional – I usually add chilli flakes or Sriracha at the table as my children aren’t into chilli (yet). Boil the water for your noodles while you grab all your ingredients. Put the almond/peanut/sunflower butter in a medium-sized glass bowl. Boil noodles according to the package instructions (or skip this stage and just use raw spiralized veg but add a splash of boiling water to loosen the sauce). 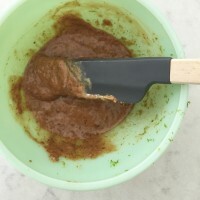 Start making your sauce by adding the following to your bowl of nut butter: the zest of 2 limes (I use my trusty Microplane zester) and juice of 1 lime; soy sauce/ tamari/ fish sauce; sweet chili sauce/a pinch of sugar. Stir, taste and adjust the balance of flavours (see note above) and set aside. Chop the onions and the basil (think of the herb as a green vegetable and use a lot unless you have a greens phobic person to cook for. In which case you can leave them out and just have everyone add them to their own bowl at the table). Grate a couple of carrots and spiralize or grate 2 courgettes. Set aside. Use metal tongs to pick the noodles out of the pan so that you keep some of the cooking water on them and dump the noodles into the sauce. You want to keep your cooking water and add it gradually as you gently stir your noodles into the sauce. The hot water helps loosen the sauce and makes it stick to the noodles so that the resulting sauce is creamy rather than sticky. I usually end up using about 3-5 tablespoons of the noodle cooking water. I find that metal tongs are the best tool for mixing. Add the basil, onions, carrots, courgettes, and the shredded cooked chicken if you’re using it, and stir. Taste and adjust the soy/tamari/fish sauce, sweet chili/sugar, lime until it tastes balanced. Serve immediately scattered with sesame seeds alongside a wedge of lime. Find more recipes for noodles, almonds, speedy and mid week meals here.